More than 70 vendors will be present to provide diabetes screening, BMI Testing, dental consultation, flu shots, healthy product presentations, voter registration, other health screenings, affordable care act counseling, senior citizens info, home health care services, and healthy cooking demonstrations. “This health fair event is our gift to the community,” said Reginald Hicks, general manager and director of WJOU. “It’s very important to know about your health and how healthy you are,” he added. During the health fair, at approximately 1:15 p.m., the WJOU-FM/Good Samaritan Hospice Health Fair Community Award will be presented to Artis and Edna Sidney, owners of Garden Cove Produce, and Cathy Miller, Community Impact Director for the United Way of Madison County. Organizers will also provide three scholarships to Oakwood University students in the areas of communication, allied health and nursing. “Not only do we want to make sure we let the community know about health, we want to help students out as well who are looking into going into these health and communication-related fields,” said Hicks. 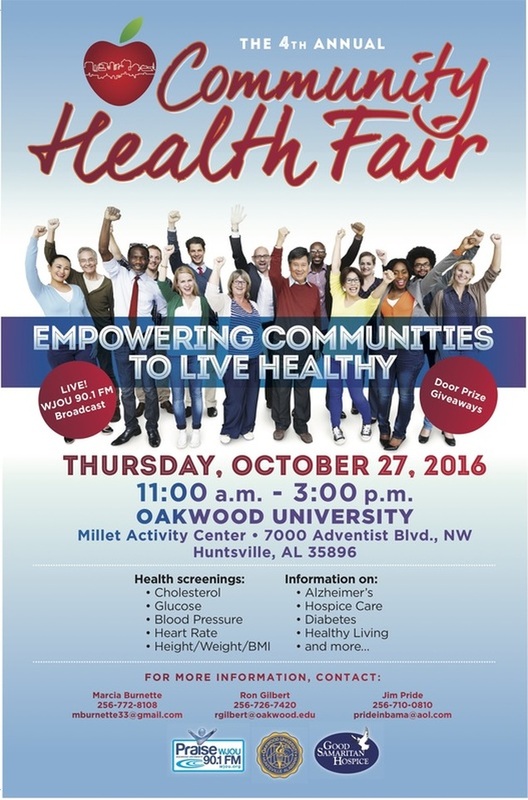 The presenting sponsors for this year’s health fair include Saria Services Group, Inc., Breath of Life Television Ministries, and the Oakwood University Church.